A year after the release of her second novel, Dancing with Butterflies, author Reyna Grande remains immersed in the world of Folklórico dance, although in a slightly different way. Now, instead of sitting in a dance studio watching rehearsals and taking copious notes of details to add to her novel, she is sitting in a studio watching her eight-year-old son practice the steps to El Jarabe Tapatío. Her son, Nathaniel Grande, age 8, has been learning the art of folklórico for a few years. Nathaniel speaks enthusiastically about performing his favorite dance, El Jarabe Tapatío. “I like the dance where we pretend to kiss,” said the young dancer. 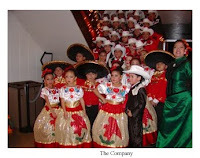 La Bloga had a special opportunity to see Nathaniel dance with Paso de Oro Dance Academy at the Whittier Community Theatre. I should clarify and say that I, not my fellow blogueros, saw the performance. Tickets to this show quickly sold out and Reyna was only able to snag one ticket using my La Bloga press pass, one of the perks of being the Friday columnist. Rumor has it I could have sold my free ticket for big bucks. The line snaking out the door an hour and a half before curtain time hinted of the seriousness of the Whittier audience. The woman who sat next to me apparently paid the inflated price of twenty dollars; the tickets were only twelve. selling copies of her books. As another famous autora once said, someone’s got to put the kid through college somehow. The 35-year-old author and mother of two speaks very proudly of her son’s love for dance. “We’ll be standing in line at the supermarket and he’ll do a zapateado,” she said. “He loves being in the group and is always dancing and stomping, even in the kitchen.” Reyna heard about the group last year when the director thought her latest novel, Dancing with Butterflies, would be a good tie in for the group and invited her to sell books at the performance. She only sold a little over a dozen copies, but she was impressed by the dance company. “When I moved to Whittier about three months ago, I decided to put Nathaniel in the group,” she said. Nathaniel went a whole summer without dancing. He conveys his initial frustration at having to watch the other dancers in order to learn the routines. He speaks energetically about next year’s performance and the opportunity to move up a level (a next step for the rising dance star). The founder and choreographer of the show, Alicia Mendibles was equally influenced by her own mother who passed on the folklórico tradition when she was Nathaniel’s age. She has directed the dance company for 17 years. She says her biggest challenge has been training the boys who are shy. 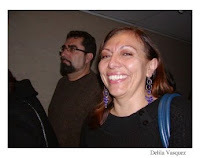 Reyna’s friend, Delila Vasquez was also in the audience. She tapped her toes, clapped and sang throughout the performance. Her three daughters danced folklórico for 13 years. “It does a lot for kids and their self-esteem,” she said. “Dance teaches boys etiquette and about relationships. Delila was excited to also witness Nathaniel’s first performance. The Program Services Director of LAUP (Los Angeles Universal Preschool) appreciates the investment of folklórico in terms of time, practice, commitment, and family. “I have three closets full of costumes,” she said. However, her daughters are too sentimental about the dresses to sell or recycle them. Delila used to help with Ballet Folklórico de Carolina in La Puente when her daughters were dancers so she knows the ins and outs of the folklórico world. “Most of the director’s profits come from the costume,” said Delila. For Paso de Oro, a single dress can cost upwards of six hundred dollars. Director Alicia Mendibles sews each costume herself in addition to serving as director and choreographer for the group. 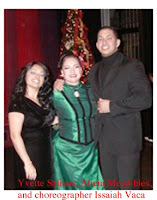 Paso de Oro Dance Academy is located at 12918 Hadley Street, Whittier, CA. Call 562, 696-7700 for more info. Next Friday, I will be participating in the Posadas beginning at El Presidio de Santa Barbara State Historic Park, 123 East Canon Perdido Street. For more information, 805-965-0093. The evening of singing and strolling on State Street culminates in a Pastorela and piñata and refreshments at Casa de la Guerra in Santa Barbara. Our singing practice went well last Monday. Hope to see you in my pueblo next week. Every kid needs to learn how to move and dance. Folklorico will give Nathaniel poise that he can use through out his life. Congratulations, Nate! Wonderful article, Melinda! 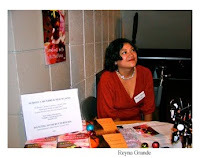 I'm a fan of Reyna Grande and her beautiful book, DANCING WITH BUTTERFLIES. I'm so glad to hear that her little one is learning the art and evidently being quite talented at it!! Good for him, as well as his mom, who must rightfully feel very proud of him. Looking forward to your next column, Melinda. Lovely post. I look forward to reaing "Dancing With Butterflies".